Use chocolate transfer sheets to decorate chocolate or to create wonderful decorations for cakes, pastries, ice cream, gelato and other desserts. Transfer sheets are easy to use and they will give a finer look to your desserts. 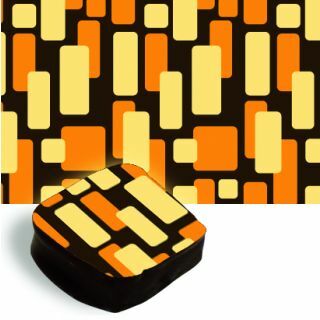 Our chocolate transfer sheets are made with pure cocoa butter. We use thin acetate plastic film on which we print edible coloring designs made from cocoa butter and FDA-approved food coloring. Our transfer sheets are made manually in an artisan way. We have developed our own printing method which resulted in very precise printed designs and denser colors. 2 color process: Pale orange and green. Sheet dimensions: 305 x 450 mm (12" x 17 3/4"). Sold in a package of 10 sheets. Storage conditions: Store in a cool, dry and dark place. Use the entire transfer sheet or cut the size you need. Spread melted chocolate over the transfer sheet or press the transfer sheet onto dipped truffles. Let cool down the chocolate until firm (24 hours at room temperature or 20 minutes in the refrigerator if you can't wait). Once the chocolate is firm, peel off the transfer sheet. The edible design will stay on the chocolate. Transfer sheets can also be used to print on fondant; contact us for more information on this technique. Transfer sheets should be used only with couverture chocolate (dark, milk or white). Final result is not guaranteed if used with compound chocolate. This product is temperature sensitive and can be damaged during high temperature season if not stored and/or manipulated properly.